Fundation project: This study was financially supported by the Thailand Research Fund (TRF), Office of the Higher Education Commission, the Faculty of Medical Technology to PN (MRG5480062). Malaria is a considerable global health burden among 91 countries and territories at risk especially in tropical regions. In the year 2016, World Health Organization estimated that approximately 216 million people worldwide were infected with malaria and of them 445 000 people died. Cerebral malaria (CM) is the major cause of death and is most frequently encountered in African children. It is hypothesized that the mechanism of CM relates excessive sequestration of parasitized red cells in the brain's microvasculature and local overproduction of inflammatory cytokines such as interferon (IFN)- γ and tissue necrotic factor- α . Despite the exact pathophysiology of CM is still unclear, it is believed that human genetic factors predispose to this clinical outcome. IFN- γ , encoded by the IFN- γ gene, affects a critical aspect in the pathogenesis of CM. The polymorphisms in IFN- γ gene and IFN- γ receptor 1 gene are associated with the clinical manifestations of malaria infection,. Although the role of IFN- α / β in malaria has not been investigated extensively, the polymorphism in IFN- α / β receptor 1 is associated with decreased risk of CM in the Gambia. In addition, a study in an experimental malaria mouse model shows that expression of the IFN-stimulated gene (Isg, also called Ifit 1-3) is remarkably upregulated in CM-susceptible mice compared to levels in resistant mice. The researchers suggest that the Ifit gene family is potentially a CM susceptibility locus. Among them, Ifit1/Isg56 expression is predominantly upregulated. These observations support the hypothesis that downstream variants in the IFN signalling pathway [IFN-induced protein with tetratricopeptide repeats (IFIT) 1 in humans] may influence whether or not CM develops. To date, there are no reports of an association between polymorphisms of IFIT1 and CM. The objective of our study was to access the relationship of single nucleotide polymorphisms (SNP) in the IFIT1 gene with the development of CM in Thai population. We recruited 314 Thai adult patients (13 years or older) infected with Plasmodium falciparum (P. falciparum) who were living in the north-west area of Thailand near Myanmar border. All subjects were >13 years old with a mean age of 25.5 and 28.6 years for uncomplicated malaria (UM) and CM, respectively. Clinical symptoms of malaria were categorized by the guidance of World Health Organization. We examined 110 CM patients who suffered from unarousable coma by excluding other causes of coma. For the control group, we selected 204 patients with UM with symptoms of febrile illness without any other cause of infection. Both groups of CM and UM were microscopically confirmed for asexual form of P. falciparum. For the control group, we excluded all patients who had any signs of severe malaria or manifestation of impairement in vital organ such as hypoglycaemia (glucose level <22 nmol/L), severe anaemia (hematocrit <20% or hemoglobin level <7 g/dL) or elevated serum creatinine (level >3.0 mg/dL), as well as high parasitaemia (>100 000 parasites/μL). All patients obtained treatment from the Hospital for Tropical Diseases, Faculty of Tropical Medicine, Mahidol University, Thailand. All patients were voluntarily involved in this study and informed consent was obtanied from all patients. The study was approved by the Institutional Review Board of the Faculty of Tropical Medicine, Mahidol University, Thailand. IFIT1 is situated on the long arm of chromosome 10 (10q23.31) and has 13 942 nucleotides in length. It consists of two exons and one intron; the first exon encodes the start codon and the second exon encodes the rest of the mRNA. To investigate the relationship between IFIT1 and CM, we selected tag-SNPs located in the IFIT1 gene based on genotypic data of the Asian HapMap samples, 45 Japanese from Tokyo, Japan and 45 Han Chinese from Beijing, China,. Tagger algorithm was executed by the Haploview Software, version 4.2 with the default settings (i.e., pairwise tagging only and linkage disequilibrium r2≥0.8). Among five tag-SNPs, one SNP (rs304478) was situated about 1.5 kbp upstream of the start codon (promoter) region of the IFIT1 gene and the other four SNPs (rs303217, rs303215, rs11203109, rs304485) were located in the intron [Figure 1]. 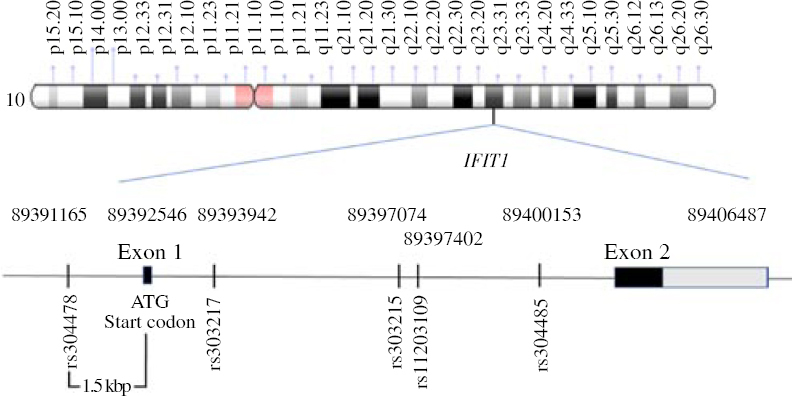 Figure 1: Chromosomal location of candidate single nucleotide polymorphisms (SNPs) in interferon-induced protein with tetratricopeptide repeats 1 (IFIT1) gene. The genomic DNA was isolated from peripheral blood leukocyte samples using QIAamp Blood Kit (Qiagen, Hilden, Germany). TaqMan SNP Genotyping Assay (Applied Biosystems, Foster City, CA, USA) was applied to genotype five SNPs in the IFIT1 gene according to the manufacturer's instructions. LightCycler 480II (Roche Diagnostics, Mannheim, Germany) was used for PCR amplification and genotypic discrimination. SNP calling was determined by LightCycler 480II Endpoint Genotyping Software, version 1.5.0.39 (Roche Diagnostics, Mannheim, Germany). To determine the extent of deviation from Hardy–Weinberg equilibrium, we compared the observed and expected frequencies of genotype in each malaria group by using χ2 test. To compare the genotype and allele frequency among malaria groups, χ2 test was used in the Statistical Package for the Social Sciences (SPSS Inc., Chicago, IL, USA), version 18.0. A P-value less than 0.05 was indicated as statistically significant difference. The association between the genotypes and allele frequency for the risk of CM was analyzed by odds ratio (OR) and 95% confidence interval (95% CI) in various models. To know the extent of linkage disequilibrium (LD) between SNPs, we computed the pairwise linkage disequilibrium coefficient by using Haploview Software, version 4.2. The haplotype frequency and its association with CM was analyzed by using Haploview Software, version 4.2. In a candidate gene association study, SNP association with the disease may be due either to the virtue of its functionality or to LD with a causal SNP in the neighbourhood. To access whether the associated SNP had LD with a nearby functional SNP, we retrieved the SNPs in the region of 10 kbp upstream and downstream from the associated SNP. Then, LD was assessed by LDlink web-based application using genotype data of the East Asian population from phase 3 of the 1 000 Genomes Project. After obtainment of the SNPs that are in LD with the associated SNP, their functional activity was predicted according to the location of the SNPs. For the SNP located in the 5' region near the IFIT1 gene, transcription factor binding sites (TFBS) were computationally predicted by PROMO database (version 3.0.2). We inserted the 5' upstream region of DNA sequences with different SNP alleles into the SearchSites of the PROMO database. The PROMO database determined the specific binding site weight matrices for TFBS prediction according to TRANSFAC database (version 8.3),. For SNP localized in the 3' untranslated region (UTR) of the IFIT1 gene, prediction of microRNA binding sites was determined using miRDB database. This database uses a bioinformatics tool, MirTarget, established from experimentally validated results of several miRNA-target interactions. 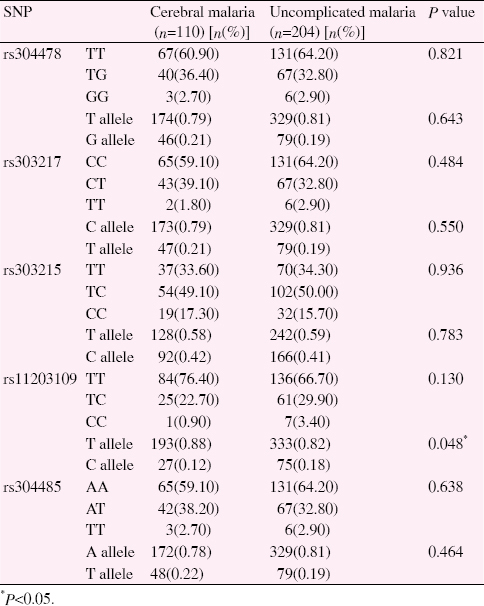 To examine possible associations between IFIT1 polymorphism and CM, genotyping of five candidate tag-SNPs was performed in 314 Thai patients infected with P. falciparum. All SNPs in each of the two malaria groups were in accordance with Hardy–Weinberg equilibrium. The genotype frequencies of all tag-SNPs in various genetic models showed no association with CM outcome. 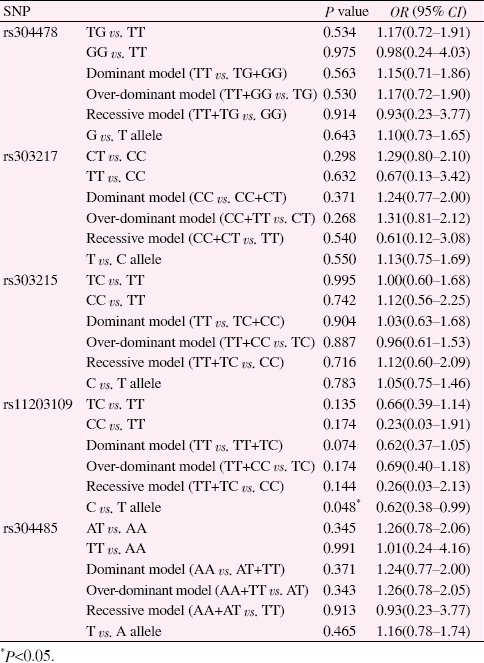 However, the minor C allele of rs11203109 was associated with decrease risk of CM (OR=0.62, 95% CI=0.38-0.99, P=0.048) [Table 1] and [Table 2]. Four major haplotypes consisting of five IFIT1 SNPs showed no association with CM [Table 3]. LD analyzed by Haploview software version 4.2 indicates that the three SNPs (rs304487, rs303217 and rs304485) were in Linkage disequilibrium (r2>0.8) [Figure 2]. Table 1: Genotype and allele frequencies of single nucleotide polymorphisms (SNPs) in interferon-induced protein with tetratricopeptide repeats (IFIT) 1. Table 2: Association of SNPs in interferon-induced protein with IFIT 1 for risk of cerebral malaria. Table 3: Haplotype analyses of rs304478, rs303217, rs303215, rs11203109 and rs304485 for the risk of cerebral malaria (CM). Figure 2: Linkage disequilibrium (LD) analysis of candidate SNPs by Haploview software version 4.2. LD plot among five tag-SNPs that was determined in 314 Thai malaria patients. A pairwise r2 value is represented in each square. The darken shade means higher r2 value. To find the SNPs that are in LD with rs11203109, we retrieved the SNPs located within 10 kbp upstream and downstream of rs11203109 that show minor allele frequency of ≥0.05 in the East Asian population (from phase 3 of 1000 Genomes Project). Among the SNPs that are in LD with rs11203109, we found one SNP located near the 5' region of IFIT1 (rs5786868), four SNPs in the intron (rs11203105, rs147997420, rs11203106, rs10788642) and one SNP in the 3' UTR (rs57941432) of the IFIT1 gene [Figure 3]. To determine whether the linking SNPs have a functional effect, we performed computational analysis for TFBS for the SNPs located in the 5' region and microRNA binding sites for the SNPs located in the 3' UTR of the IFIT1. [Table 4] shows the SNP that are in LD with rs11203109 and results of the computational prediction of TFBS and microRNA binding sites. Figure 3: Chromosomal position of SNPs that are in LD with rs11203109. IFIT1 : interferon-induced protein with tetratricopeptide repeats1 gene. LD was assessed by LDlink web-based application that used genotype data of the East Asian from phase 3 of the 1 000 Genomes Project and reference SNP accession numbers are indexed from dbSNP build 142. * indicates the position of the associated SNP. Table 4: Computational prediction for functional effect of SNPs that are in LD with rs11203109. 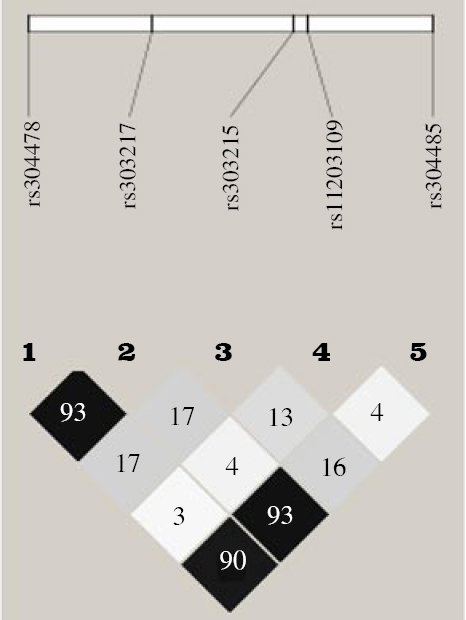 To address the involvement of IFIT1 gene polymorphism in CM, we performed case-control association study in 314 Thai malaria patients infected with P. falciparum, grouped as having CM or UM. Out of five selected tag-SNPs in IFIT1, one intronic SNP (rs11203109-C allele) was associated with protection against CM. The basis of this association may be that the associated allele acts as a functional SNP and alters the transcription level of IFIT1. The functional evidence of this non-coding intronic SNP is unclear. No one has reported that this intronic SNP has a functional effect on the expression of the IFIT1 gene nor of mRNA splicing. Another possibility is that the associated SNP is in linkage disequilibrium with a neighboring causal SNP (D' or r2 >0.8) based on analysis of the region spanning 10 kbp upstream and downstream from rs11203109. The best explanation for the associated SNP (rs11203109) may be due to a LD with a nearby functional SNP. We therefore executed a computational prediction for the SNP functional effect. We predicted TFBS near the linked SNP (rs5786868) that is located in the 5' region near the IFIT1 (promoter region). Hence rs5786868 is an INDEL SNP and the allele with G creates binding sites for two transcription factors, glucocorticoid receptor- α and androgen receptor, compared to that of the allele with G deletion. This finding suggests that the rs5786868 SNP could alter the expression of the IFIT1. So, rs5786868 is probably a functional SNP that influences the susceptibility to develop CM. Moreover, microRNA modulates gene expression either by transcriptional modification or translational repression in terms of microRNA sequences complementary with 3'UTR of the gene. So, we performed the prediction of microRNA binding sites in the 3'UTR of the IFIT1 at the position of rs57941432. However, there were no predicted microRNA binding sites in either allele. For the remaining four LD SNPs located in the intron, we found no reports of functional evidence. Interestingly, a scientific report stated that rs57941432 may behave as an expression quantitative trait locus (eQTL) of IFIT5 in liver tissue. An eQTL is a locus that explains a portion of the genetic variance of a gene expression phenotype. It is still unresolved whether eQTL is involved in the regulatory control of expression in a tissue-specific manner. Moreover, the same regulatory regions and variants could be an eQTL for different genes in different tissues. This information supports the concept that rs57941432 might have a functional role in CM outcome by regulating the IFIT gene. So, our finding of an associated SNP (rs11203109) might truly be a genetic marker for CM outcome since the two LD SNPs (rs5786868 and rs57941432) are putatively functional. In the haplotype analysis, four major haplotypes were found among Thai patients. The haplotype frequencies in CM and UM groups were comparable. No significant association of the IFIT1 haplotypes with CM was found. This suggests that there was no synergistic effect among the candidate SNPs on CM outcome. Although we selected the candidate genes from tag-SNP based on the data of HapMap, we found high LD values (r2>0.8) among rs304487, rs303217 and rs304485. So, one of those three SNPs should be considered for future research about IFIT1 genetics in Thai population. Association studies of IFIT1 polymorphism in other diseases are rare. Xie et al. reported that rs11203109 C allele is associated with a better virological response after IFN- α treatment in chronic hepatitis B infection. This finding appears to support our own that polymorphism in the IFIT1 gene may give a beneficial effect to the host against malaria infection via triggering the IFN signalling pathway. In conclusion, this study found that a polymorphism in the intron of IFIT1 (C allele of rs11203109) was associated with protection from CM in Thai population. Computational predictions indicated that rs11203109 might be a genetic marker of cerebral malaria outcome, as it is in LD with SNPs which are probably functional. Experimental validation is necessary to confirm this and to understand the regulatory mechanisms of these functional SNPs. Nevertheless, our study highlights the potential role of IFIT1 polymorphism in the development of CM. We appreciate and thanks to the patients who were involved in this research. We thank Dr. Arthur Brown for editing the language of this manuscript. This study was financially supported by the Thailand Research Fund (TRF), Office of the Higher Education Commission, the Faculty of Medical Technology to PN (MRG5480062). Saw Thu Wah is the PhD student supported by the Norwegian Ministry of Foreign Affairs, in collaboration with Mahidol University, which provided the Norwegian Scholarship for Capacity Building for Institutions in Myanmar. Wah ST, Hananantachai H, Kerdpin U, Plabplueng C, Prachayasittikul V, Nuchnoi P. Molecular basis of human cerebral malaria development. Trop Med Health 2016; 44: 33. Koch O, Awomoyi A, Usen S, Jallow M, Richardson A, Hull J, et al. IFNGR' gene promoter polymorphisms and susceptibility to cerebral malaria. J Infect Dis 2002; 185(11): 1684-1687. Kanchan K, Jha P, Pati SS, Mohanty S, Mishra SK, Sharma SK, et al. Interferon-gamma (IFNG) microsatellite repeat and single nucleotide polymorphism haplotypes of IFN-alpha receptor (IFNAR1) associated with enhanced malaria susceptibility in Indian populations. Infect Genet Evol 2015; 29: 6-14. Aucan C, Walley AJ, Hennig BJ, Fitness J, Frodsham A, Zhang L, et al. Interferon-alpha receptor-1 (IFNAR1) variants are associated with protection against cerebral malaria in the Gambia. Genes Immun 2003; 4(4): 275-282. Berghout J, Min-Oo G, Tam M, Gauthier S, Stevenson MM, Gros P. Identification of a novel cerebral malaria susceptibility locus (Berr5) on mouse chromosome 19. Genes Immun 2010; 11(4): 310-318. The International HapMap Consortium. A haplotype map of the human genome. Nature 2005; 437(7063): 1299-1320. The International HapMap Consortium. The international HapMap project. Nature 2003; 426(6968): 789-796. Barrett JC, Fry B, Maller J, Daly MJ. Haploview: Analysis and visualization of LD and haplotype maps. Bioinformatics 2005; 21(2): 263-265. Albert PR. What is a functional genetic polymorphism? Defining classes of functionality. J Psychiatr Neurosci 2011; 36(6): 363. Machiela MJ, Chanock SJ. LDlink: A web-based application for exploring population-specific haplotype structure and linking correlated alleles of possible functional variants. Bioinformatics 2015; 31(21): 35553557. Farré D, Roset R, Huerta M, Adsuara JE, Roselló L, Albà MM, Messeguer X. Identification of patterns in biological sequences at the ALGGEN server: PROMO and MALGEN. Nucleic Acids Res 2003; 31(13): 3651-3653. Messeguer X, Escudero R, Farré D, Núñez O, Martinez J, Albà MM. PROMO: Detection of known transcription regulatory elements using species-tailored searches. Bioinformatics 2002; 18(2): 333-334. Wong N, Wang X. miRDB: An online resource for microRNA target prediction and functional annotations. Nucleic Acids Res 2015; 43(D1) D146-D152. Catalanotto C, Cogoni C, Zardo G. MicroRNA in control of gene expression: An overview of nuclear functions. Int J Mol Sci 2016; 17(10): 1712. Franzén O, Ermel R, Cohain A, Akers NK, Di Narzo A, Talukdar HA, et al. Cardiometabolic risk loci share downstream cis- and trans-gene regulation across tissues and diseases. Science 2016; 353(6301): 827-830. Nica AC, Dermitzakis ET. Expression quantitative trait loci: Present and future. Philos Trans R Soc Lond B Biol Sci 2013; 368(1620). Xie DY, Wang SM, Yang JM, Wang LH, Chen HY, Huai C, et al. IFIT' polymorphisms predict interferon- α treatment efficiency for hepatitis B virus infection. World J Gastroenterol 2016; 22(44): 9813-9821.